Why did you look for a contractor? Removal of a tree that downed a power line on a commercial site. Why did you choose this particular contractor? Emergency availability, insurance and bonding. Excellent – and faster than I expected. If a friend asked you for a referral, what would you say about this contractor? I’d give a very good recommendation and yes, I plan to use them again. We just had a nasty storm in Northern California. 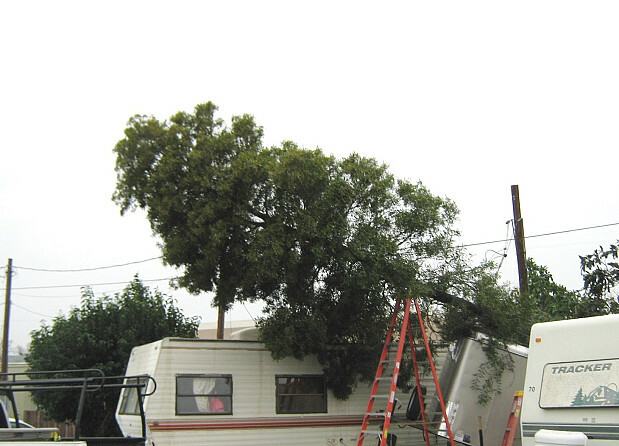 The winds were so strong they knocked down an acacia tree, which fell on a power line in the RV park I manage. Northern Cal was really slammed hard and of course, anytime that happens, the tree dudes go to work night and day. I had to shut the power off and close down the middle section of my park (about 6 units). I actually started to chop down the acacia myself … but I quickly decided that I was a goober, a doctor operating on himself, because I didn’t know what I didn’t know. It’s just that the trees were intertwined in the electrical wires. That part didn’t bother me, but I probably would have caused some damage to nearby trailers if the tree fell the wrong way. Out of the 6 or 7 local tree service guys I phoned, I think I got 2 callbacks, Prodigy Works and one other. It took a few days, which was a bummer, but his crews were working day and night all over. When they got to me, they came out with this chipper like none I’ve ever seen before, and threw in these huge logs that they could barely lift – I would say 2 feet in diameter. The shredder turned those logs into dust. I was thinking, “Let’s make a horror movie;” it was that scary. Those dudes -- their work was like poetry! They sure knew what they were doing. One guy practically danced on the tree, climbing up and down without any effort. The crew handled the job in only 4-5 hours – they’ve got excellent equipment – and now I have a tree service. That’s great, because I do have some tree issues which will need to be addressed sooner rather than later. What advice would you give to others based on your experience? 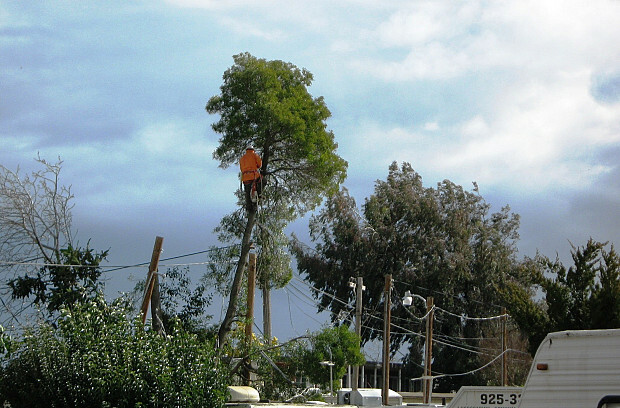 When you hire a tree service, make sure that they’re bonded and insured. They’re doing dangerous work. Awesome Kitchen Tile Backsplash by Brittany B. Gas Line Replacement By A Plumber Who Takes Pride In His Work by Bill C.